Here in Australia, we have whats called the SES (State Emergency Service). It is an emergency and rescue service that is dedicated to assisting the community and is made up mostly by volunteers. My brother recently completed his training, and has now joined the ranks of those awesome volunteers! 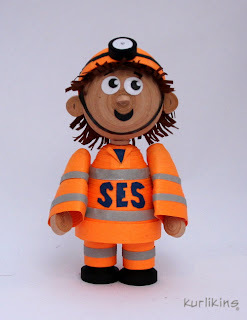 So for his birthday, I decided to show him how proud I am by creating a one of a kind SES man! Getting the proportions right on this little guy was pretty important. I started by making the head, and working my onward from there. Fitting the helmet took a little working around. The dome shapes of the head needed to fit snugly inside the helmet. With a load of re-positioning and filling the gaps up with hair- his helmet sits back off his head a little, which I think is pretty cute. I would love to say that the helmet was removable, but considering the dangerous situations these volunteers put themselves into- It worked better if it stayed stuck on! SES man was made with a variety of strip sizes- 6mm, 3mm, 1.5mm... whatever detail I was after, determined what size strip I needed to cut. The letters of S.E.S were also hand cut out. This little guy stands at an adorable 7cm / 2.7" tall. How super cute is this little avatar from the Wii game- LittleBig Planet! 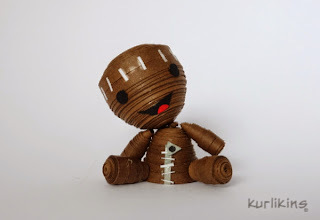 The original Sackboy is apparently made from sackcloth, stuffed with fluff and (believe it or not) Icecream! 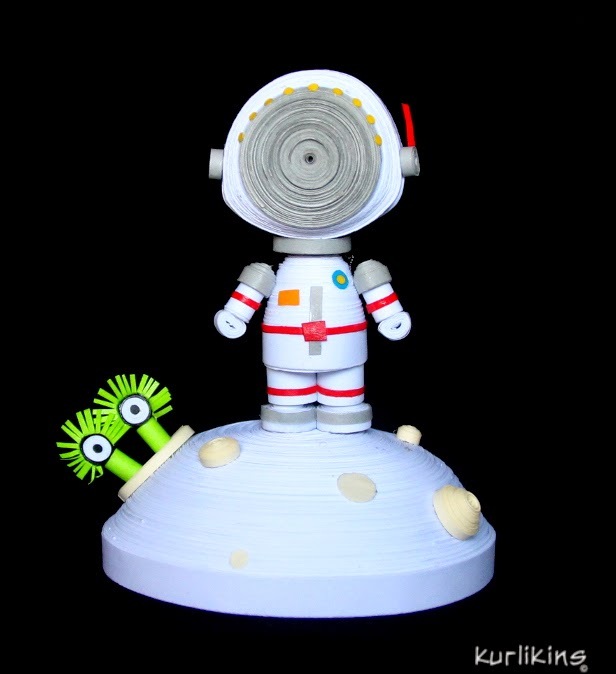 This Kurlikins version however, is made from... you guessed it- 100% paper! After doing a little reading on these adorable characters, it turns out that all the Sackpeople that you meet going through the different worlds are 8cm tall. This makes it a first for Kurlikins- making a character life size! (or maybe just a little bit smaller). In making Sackboy, the basics of 3D quilling were used. Simple dome shapes to create the head, and cone shapes to make the body and limbs. 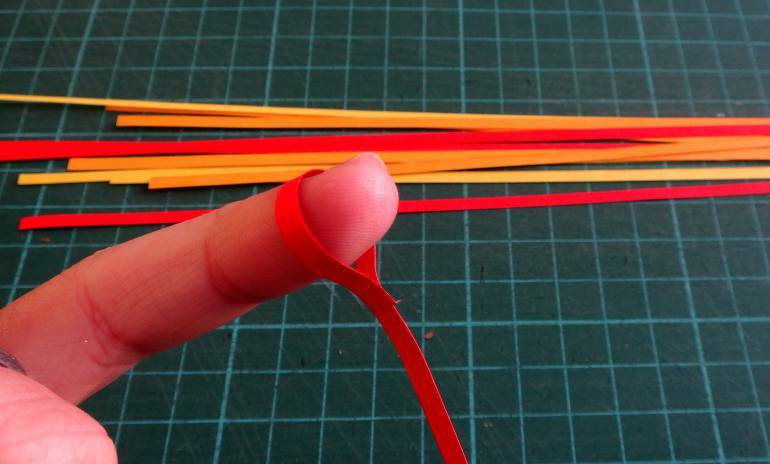 Because he is quite little in size, only 3mm strips were used. Tiny strips of grey were used for the detailing- making the zipper and to show the stitching around the head. 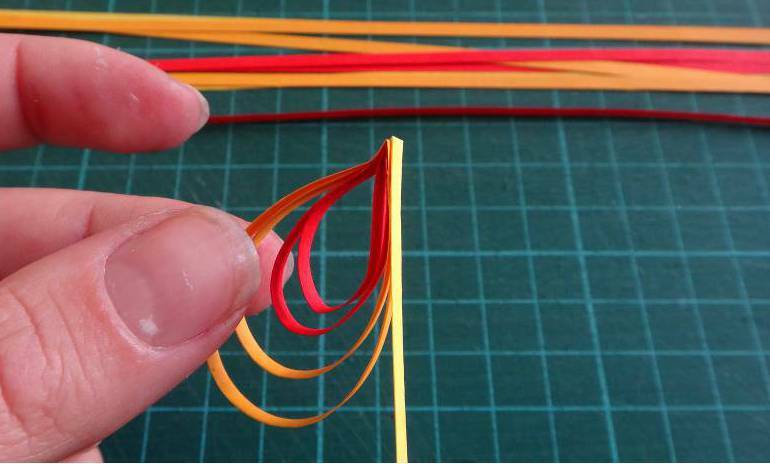 Like with all 3D quilling, using minimal glue applied with something like a toothpick really helps out getting the teensy tiny bits of paper stuck where you want it to go. Have you played LittleBig Planet? What dress up do you like your Sackperson in? "The claw is our master. The claw chooses who will go and who will stay..."
The making of Mr Potato Head was pretty straight forward- even with the loads of little bits that needed to go together. There were a lot of laugh-out-loud moments as body parts were stuck and fell off, swapped and rearranged just like his character in the movies... cheeky! The alien was a little bit more challenging... no wait, down right difficult! His shapes aren't quite round, so loads of molding and scolding went into getting this little guy just right. A combination of strips were used for both characters- 3mm and 6mm (1/8" and 1/4") I've found that when making larger shapes (eg. Mr Potato Head's body) 6mm (1/4") strips work better- and are waaay more forgiving. The details however, work better with the thinner strip, although can be more tricky getting the shape to work right. Both these characters stand at around 5cm (2in) tall. 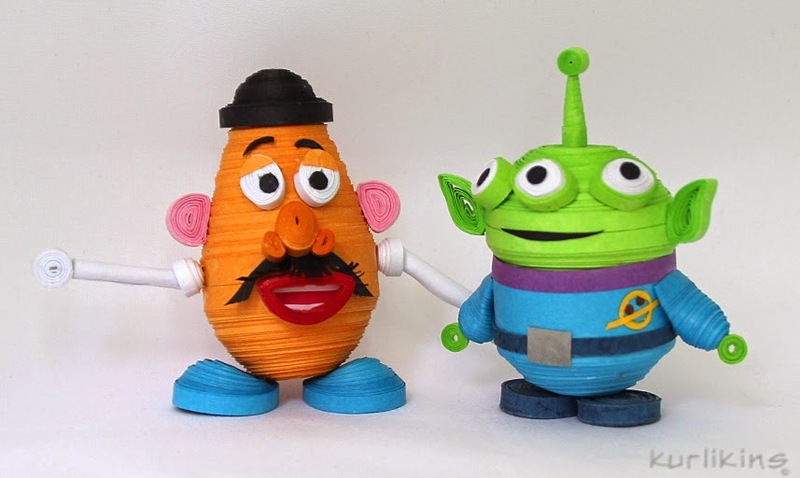 So... Let me know: Who's YOUR favourite Toy Story Character? This little wicked witch should have made an appearance for Halloween... but I guess she was off on her broomstick doing whatever wicked things witches do. The making of this little witch was quite wicked indeed, especially the making of her hat! It was the first time I'd attempted to make a hat like this, and this took a lot of work- making pointy with 3D quilling isn't the easiest of tasks. The body of the witch was made with all the basic quilling shapes. The nose is by far my favorite- a big, gnarly, hooked, cone nose, with a juicy red boil! Delicious! All parts of this witch were made with 3mm strips. This little miniature- Kurlikins style- is of my little sister, who graduated with a degree in psychology over the weekend. There were a few new techniques in this design that took a little working out. As you could probably guess, the hat was a little challenging to get fitting correctly. This little graduation girl stands all on her own at 5.5cm (2.2 in) tall. Her body is made from 6mm strips which gave her a good solid base to work from. The rest of her body is made from 3mm strips. Here's my Tiny Tot Dragon. He's how I'd imagine dragons on their first day at school- cute, small, and without the fire power. 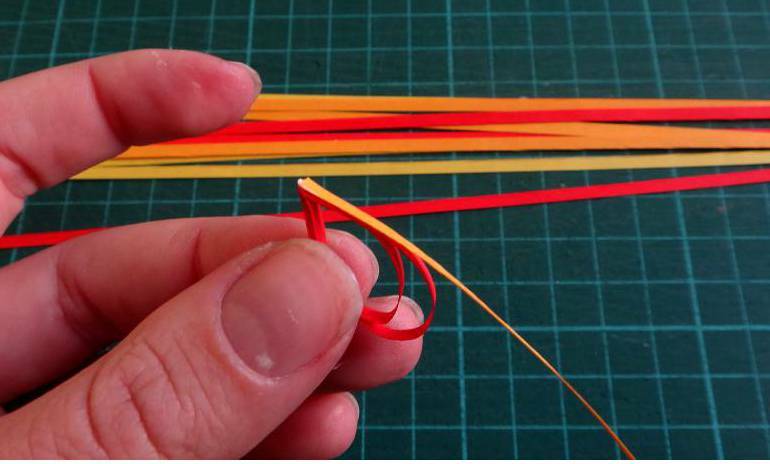 All very straight forward 3D quilling techniques were used- with the most complicated part being his tail. A hint for making a curve like this- wait till the clue is pretty much dry, and then, coax it into the desired shape. Tiny tot dragon is just shy of 5cm tall (under 2 in). Who doesn't love Babushka Nesting Dolls?? This project was a challenge set by my awesomely supportive sister, who has quite the collection of nesting dolls. So what better then to make them as a special present for her 40th Birthday! The sizes range from a tiny 1.5 cm up to the big mumma at around 8cm tall. They all nest beautifully inside each other- which I kinda see it as them all gobbling each other up. Getting the detail of the faces to be progressively smaller was the real challenge. Once I got the size I liked for the smallest one, it was simply a case of doubling all the dimensions.